So here is a question. Are you a Trader Joe’s person? You will know, right away, if your answer is yes or if your answer is no. These Trader Joe’s people – they know what I mean. I carried this opinion with me until this week when I went shopping for my little book swap party. My town did not even have a Trader Joe’s until about a month ago. Sure I could drive an hour south, or an hour west, but that wasn’t going to happen just for some snacks. When our local store opened, I mocked the visitors who stood outside for hours waiting to get in. However, if you are considering snacks for dinner (one of my personal favorites) I am now going to endorse Trader Joe’s as the place to go. I think I spent $40 and got snacks for ten women, a ton of chocolate, and my Easter lilies. I’ve been converted. There is beauty in snacks – can I get an AMEN? There is beauty in the simplicity of a “neighborhood grocery store.” Although, I won’t dwell on the fact that this store is certainly not in my neighborhood. Instead I drove twenty minutes to the store from work and then to my house. I guess the small grocer feel is growing on me. As much as a small grocer feel can exist given the nature of a franchise, national distribution, and competition, if you can call 7-11 a corner grocery store. Give things a second or third look – it can change your opinion if you look past your own snoodiness (ok, ok, my own snoodiness. And yes, snoodiness is a word. Just for tonight.) 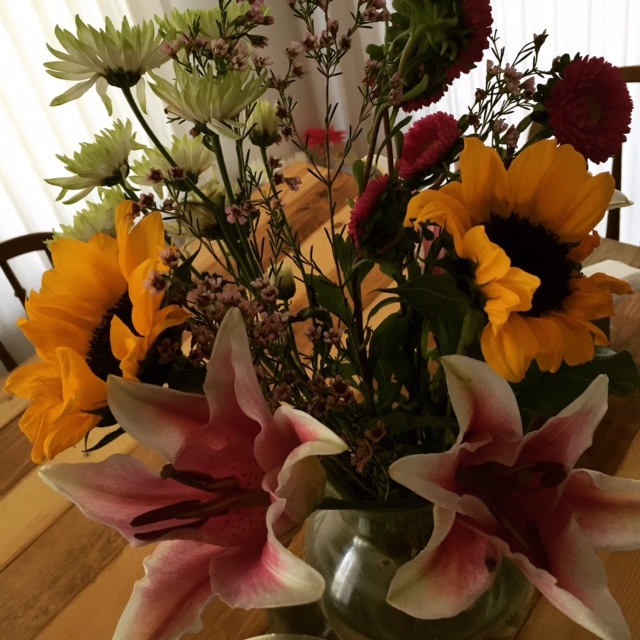 My flowers still smell enchanting. I feel like this past week flew by in a blur. We had three family celebrations, each with their own beautiful quirks of family interaction and dynamics. I participated in an egg hunt and opened not one, but two Easter baskets. I am swimming in chocolate eggs. Come hang out with me and I will share. You can pick from Cadbury Mini Eggs to Almond M&Ms. I am thrilled that my families still partake in traditions that delight and spoil me. Confession: I did not go to church this year. I actually missed it. There is beauty in tradition, and spiritual practice, and ritual that for me, ties and connects me to a higher power. I still texted my mom, “HE IS RISEN” and was glad she texted back, “HE IS RISEN INDEED”. It’s odd not saying that in a formal church setting, but I’m learning to carry components of religion and tradition in my own heart and answer those questions in each different stage of life. I delight in celebrations and the beauty of warm days. Of winter turning into spring. Of promise in looking at things in a different way. Of sunburns and lemon bars and ham with cheesy potatoes. So, really, are you a Trader Joe’s person or what? 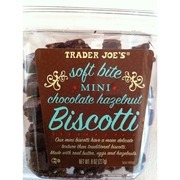 Biscotti: I bought some at Trader Joe’s. Chocolate hazelnut. It’s delicious. OH! and I got a cookbook with only biscotti recipes in my Easter basket. Bring on the baking inspiration! Do you think I can get almond paste at Trader Joe’s? So here is another question. Does Trader Joe’s really not have a Twitter account?